Ross Gaudet and Nick Bonino led a group of five Terriers with multiple-point games in a 6-2 thumping of visiting UMass. Gaudet, a former All-Scholastic forward at Austin Prep who didn’t dress at all as a freshman, scored BU’s first two goals—first, off a rebound and then off a face off—and with a third best on the team seven goal, has been a surprising source of offense. Bonino assisted on both Gaudet goals and later set up Luke Popko’s shorthanded goal in the final minutes of the game. The three helpers enabled Bonino to reach the 100 point mark for his career. He’s the 77th Terrier to do so and is tied with Rich Brennan. Colby Cohen (photo—credit Sarah Gordon/DFP) added his team leading 9th goal and an assist, while Vinny Saponari’s 3rd in the past four games and a power play blast by Max Nicastro accounted for the other goals. Kieran Millan had another strong game in goal, turning aside 39 Minutemen shots. • BU scored on two of five power play chances. • Terriers won the face off battle, 43-35, and scored twice on face offs. BU gets the weekend off to prepare for Monday’s Beanpot opener against its opponent from last year’s tournament championship game, Northeastern. • Post-game comments from Gaudet. Brandon Yip assisted on both Avalanche goals, but Colorado lost 3-2 to Dallas. Yip now has 13 points in 17 games. Colin Wilson scored his 9th goal in Milwaukee's 2-0 win against Houston. BU ends January at home against the same opponent that opened the month: UMass. BU earned a one-sided 7-3 win back on Jan. 2 led by Colby Cohen and Zach Cohen, who each had a pair of goals. UMass coach Don Cahoon was especially displeased with his team's play that night and the Minutemen have played better hockey of late, winning four of the past five games and tying BC for second place in the conference. UMass is led by the nation's top point-getter, James Marcou and Casey Wellman, tied for the lead in goals nationally. The visitors edged BU in the season opener, 3-2, so this game determines who wins the season's series. The 7 p.m. start will air on the All-Access subscription site. -- Feature on Beanpot Media Day with video interviews with Kevin Shattenkirk and Zach Cohen. 2010 recruit Charlie Coyle has been picking up kudos from the scouting community of late. He didn’t make TSN's top 30 project draft choices, but the high-scoring right wing was in a group of 10 getting honorable mention. Jacques Joubert, captain of the Terriers’ 1995 National Championship team, has been selected for induction in the BU Athletics Hall of Fame this May. He joins 45 other Terrier hockey players so honored including Chris Drury, Jack O’Callahan, Rick Meagher, Steve Stirling, Jack Kelley and Jack Parker. Joubert scored 131 points in a three-year BU career (he’d transferred from Princeton) including 53 points (29-23) in his senior season. His final point was the game-winning goal in BU’s 6-2 title game win over Maine. On the Avalanche Web site, Brandon Yip discusses (video) his early NHL success as well as the prospects for Kevin Shattenkirk, Colby Cohen and Kieran Millan, all Avs’ draft picks, to join him in Colorado. A pair of former Terrier teammates have been signed to PTOs by the AHL Hartford Wolf Pack. After beginning the season with Lake Erie, Schaeffer played 31 games for Charlotte in the ECHL. Roche also had been with Charlotte with a 16-13-29 in 34 games. AHL.com looks at first-year pro John McCarthy’s increased offensive output. Colin Wilson scored the shootout winner in the Milwaukee Admirals 4-3 win over San Antonio. Former BU captain Sean Sullivan scored his 9th goal for the Rampage. Wilson has a 7-13-20 line in 29 games with the Admirals. Sullivan has 30 points and is the Rampage’s 2nd leading scorer. He's third in scoring among AHL defensemen. The Terriers' modest two-game win streak and a chance to move up the Hockey East race disappeared as BU fell to New Hampshire at Agganis Arena 4-1. The Wildcats, who have always played well at Agganis, grabbed a 3-0 lead before BU got on the board with a Chris Connolly power play goal in the third period. Grant Rollheiser took the loss in goal, his first in a year. It was a disppointing effort following Friday's win over BC. Cason Hohmann foll0wed his four-point night Friday with his fourth goal of the season and an assists in Cedar Rapids, 3-2 win over Youngstown in USHL play. Easily the youngest player on his team, Hohmann now has 21 points and is sixth in scoring on the Roughriders. Terriers take on conference leader New Hampshire tonight, needing a win to split the season series. BU lost one and tied one with the Wildcats earlier this season. The 7 p.m. start at Agganis Arena airs on NESN. BU Coach Jack Parker will keep the same lines and defensive pairings as last night, but sophomore Grant Rollheiser gets the start in goal. His previous start was last weekend's win against Merrimack. More from last night's win Vinny Saponari's goal, knocked out of the air baseball-style, was the #1 highlight on ESPN's SportsCenter. The USCHO game coverage now includes Melissa Wade's photo display (nearly 200 shots). Tell me if you’ve heard this one before. A tie game in overtime. The puck comes off Colby Cohen’s stick, hits a defenseman and finds its way into the net for game-winner. Happened again last night. Cohen’s goal—his fifth in the past five games and eighth overall--didn’t deliver a national title like his OT winner last April 11, but it did close out a 5-4 win over BC at Conte Forum that enabled BU to win the Hockey East regular season series from its archrival. Kieran Millan stopped 42 Eagle shots, while his teammates converted three of seven power plays and won the faceoff battle, 37-35. Nick Bonino and David Warsofsky each recorded their sixth goal of the campaign, while Vinny Saponari scored his fifth and Wade Megan his third. Bonino added an assist to his goal and now stands at 97 career points. BU returns to Agganis Arena Saturday evening to play conference-leading New Hampshire. Brandon Yip continues to wield a hot stick. He scored his 6th goal in 14 games on a power play as Colorado edged Nashville, 2-1 . It was the first NHL game-winner (video) for the right winger who while at BU scored game-winners in the 2006 and 2009 Hockey East Championship games. Check back for more coverage and links. The third and possibly final meeting of the season between the Commonwealth Avenue rivals is on tap for tonight as the Terriers head up the Green Line to Conte Forum. The game begins at 7:30 p.m. and airs on NESN. No video Web cast. It is the 249th meeting between BU and BC and the Terriers lead the series, 124-107-17 (.534). Kieran Millan is scheduled to start in goal for BU. Here's the rest of the lineup. Live blogs on The Boston Hockey Blog and and WTBU. Wednesday’s Terrier practice grew a bit testy as assistant captain Eric Gryba fought with several teammates including his roommate, Zach Cohen. Both The Daily Free Press and WTBU offer more details. HockeyEastonOnline previews the weekends games including BU's games at BC on Friday and at home against New Hampshire on Saturday. Matt Radoslovich has joined the Tulsa Oilers of the CHL. Radoslovich, who spent the past two years with the Trenton Devils, had originally hoped to play in Europe this season but a snafu ended that opportunity. New England Hockey Journal's feature on Central Scouting's midterm rankings includes NHL scout Gary Eggleston's comments on 2010 recruit Charlie Coyle. Coyle is another productive player with the size and talent to be an early pick at the draft. Tony Amonte’s cousin will attend Boston University next season and has been impressive this season in junior. Like Hayes, Coyle has a shot at making the USA Under-18 team in April. Eggleston also feels that Coyle is an excellent one-on-one player who wins a lot of battles for loose pucks, telling a story about watching him in a game where the winger skated into the corner outnumbered two to one, but emerged with the puck around the other side of the net, generating a quality scoring chance. “He’s got a long reach and protects the puck well because he’s a strong kid,” Eggleston said. 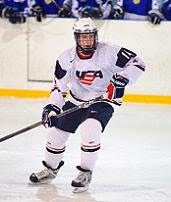 TheLetsGoDU blog reports that NTDP forward Austin Czarnik, a 2011 recruit, is considering BU, Denver and Michigan, as well as the OHL for his next career step. Czarnik, who led the U17s in scoring a year ago, had previously verballed to Michigan State, but later decommitted. BU's 2010 recruit class includes two NTDP players, Matt Nieto and Adam Clendening. It’s been a good week for Terrier 2010 recruit Charlie Coyle. First, he was ranked #19 among North American skaters for the June draft by NHL Central Scouting. During the South Shore Kings' weekend road trip, he surpassed the 50 point mark with a pair of two-goal games and an assist in another. On Monday, he played in the EJHL All-Star game, tallying an assist. Coyle is an explosive and gifted skater with a smooth and fluid stride who has garnered more attention and developed into a more all-around player since the start of the season. He often is shadowed, yet with his acceleration, speed and ability to understand the game, he usually eludes opposing players, resulting in multiple-point games. Blog contributor candycanes99 provides video of Coyle--#3, same as his cousin Tony Amonte’s number at BU— playing against the Philadelphia Revolution and some comments on his playing strengths. an aggressive game in his own zone and along the boards. His top speed was not extremely fast, but his skating stride is very smooth overall. Coyle is currently playing the point during plays with South Shore, but also showed a knack for driving to the net during even strength offensive chances and would be well suited to that position as well. His passes were all very crisp, and he was looking for the pass whenever available, which was rare among players in the game. Coyle's skills with the puck are also an asset, as he was able to maneuver around defenders. Highlights from the game against Philadelphia include a very nice assist where he was able to take a pass in stride creating a 2-on-1 opportunity and a short saucer pass over the defender's stick to the goal scorer. The Daily Free Press looks at the emergence of Joe Pereira and Ross Gaudet as key components of BU’s offense. Junior center Nick Bonino’s four assists on Saturday night bring him to 95 career points. HockeyEastOnline’s weekly release points out that sophomore goaltender Grant Rollheiser is 4-0-4 in his last eight decisions and last suffered a loss on Jan. 13, 2009, against Providence. In his third start since returning from an injury, Islanders goalie Rick DiPierto outdueled Martin Brodeur and shut outs the Devils, 4-0 on Monday. Chris Drury scored his second goal (link to video) in two games while fellow Hobey Baker winner Matt Gilroy added two assists in the Rangers' 8-2 blowout of Tampa. Former BU captain Sean Sullivan participated in tonight’s AHL All-star game, won by Canada. Boomer on the move again. Bryan Ewing was signed by the Reading Royals, his second ECHL stop this season. He began the season with AHL Rockford then was assigned to IHL Toledo. After scoring eight goals in his last 11 games for the Walleye, Ewing was recalled to Rockford, then released, which led him to the Royals. Charlotte topped Gwinnett, 6-4 despite goals by Jason Lawrence and Chris Higgins for the Knights. Higgins has five goals in his first seven games with Gwinnett. After two tepid periods of play, BU broke a 3-3 tied with three final period goals to beat Merrimack, 6-4 and return to the winning side of the ledger last night at Agganis Arena. Joe Pereira, Chris Connolly and Vinny Saponari (ENG) had the goals, matched only by one extra-attacker Warrior goal in the final minutes. Colby Cohen scored twice on power plays—the first off a slick Saponari pass (check the video)—and now is tied for second in the nation in goals by defensemen with seven. Sophomore Ross Gaudet had opened the BU scoring with his second goal of the weekend. Cohen’s second two-goal effort of the month earned him first-star honors, but Coach Jack Parker singled out goalie Grant Rollheiser (photo) who stopped 39 shots. Two Warrior goals came with a man-advantage and a third was scored just seconds after a Terrier penalty ended. The other goal, Merrimack’s first came on a breakaway when BU assistant captain fell down. The fifth anniversary of Agganis Arena (technically, it was Jan. 3) was celebrated last night with Travis Roy dropping the puck in a pregame ceremony. BU opened its current home with a 2-1 win over Minnesota. Brad Zancanaro scored the first-ever goal at Agganis. Former Terrier goalie Rick DiPietro earned his first NHL win since December 2008 last night in a 3-2 shootout Islanders win over Buffalo. DiPietro, missed a full season recovering from knee surgery, outdueled Ryan Miller and stopped 31 shots in regulation and five more in the shootout. The Sabres got a goal from Mike Grier, his ninth of the season. The outcome wasn't so good for former BU All-American John Curry. In his first start since his recall from the AHL, the Penguins' netminder gave up five goals on 14 shots in a 6-2 loss to Vancouver. 2010 recruit Charlie Coyle scored two power play goals to lead South Shore Kings past Apple Core, 3-2. Coyle now has 50 points, second best in the EJHL. We hope to post some video soon of Coyle in Friday's game against the Philadelphia Revolution. Terriers gave up three second-period goals and were stymied by Providence goalie Alex Beaudry until the third period, in a 3-1 loss to the Friars. Beaudry, who stopped 28 shots, had beaten the Terriers last January as a midseason addition to the Providence squad. Two of the Friar goals came on the power play and were deflected of the sticks of BU defensemen. The third was on a breakaway following a defensive give-away. BU's lone goal was the fourth of the season for sophomore Ross Gaudet. A turning point came in the second period with PC ahead by one. BU had a 2-man advantage for about a minute and failed to convert, and as often happens, they gave up a goal shortly after the power play ended. BU returns to action tonight with a home game against Merrimack. 2010 recruit Charlie Coyle picked up his 35th assist of the season in South Shore Kings' 4-2 over Philadelphia in EJHL play. Coyle is second in the league in scoring (48 points) and second in assists. 2011 recruit Cason Hohmann recorded his 12th assist in Cedar Rapids' 4-3 loss to Green Bay. BU will head South on I-95 to Providence today for the first of two conference matchups this weekend, as the Terrier try to claw their way up the Hockey East standings. BU beat the Friars convincingly at Schneider Arena last season, but Providence was one of only five teams to beat BU last season, handing the Terriers a 4-2 defeat at Agganis Arena. Tonight’s game airs on NESN with a 7:30 p.m. start. Links to game notes, game tracker and the WZZN Radio Webcast are here. USCHO’s Weekly Hockey East column includes a Melissa Wade photo gallery of David Warsofsky at the World Junior Championships in Saskatoon. Tonight's BU line-up; same as last game. Former BU captain Sean Sullivan scored his seventh goal of the season for AHL San Antonio in a 5-3 loss to Chicago. Sullivan, named to the league All-Star Game next Tuesday, is second on the Rampage in scoring and tied for third among all AHL blueliners. Another ex-BU defenseman playing in the AHL, Brian Strait, leads all defensemen on the WilkesBarre/Scranton Penguins in +/- . The Boston Hockey Blog reported on Wednesday's Terrier practice with an injury update and the coaches' choice to start in goal Friday night against Providence. Reporter Scott McLaughlin also spoke with Coach Jack Parker about the status of injured recruit Yasin Cisse and Sahir Gill (photo) who has made a midseason change of teams. The Vernon Morning Star spoke with Gill about his move from the USHL Chicago Steel back to the BCHL Vernon Vipers, the team he played for in 2008-09 with current Terrier Ryan Santana. 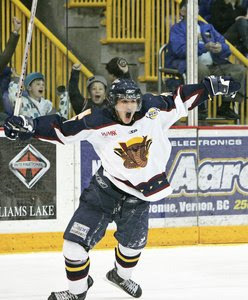 In his first game with Vernon, against the BCHL All-Stars, he picked up an assist. The Boston Globe checked in with David Warsofsky on the Frozen Fenway game. Mike McMahon of the Eagle Tribune talk with John McCarthy about his first week in the NHL. McCarthy's promtion to San Jose made him the fourth member of the 2008-09 squad (along with Matt Gilroy, Colin Wilson and Brandon Yip) to reach the NHL in their first pro season. But another BU Frozen Four team well exceeded that mark. After beating Maine in overtime (video) for the 1991 Hockey East title, the Terriers blasted past Michigan and Clarkson in the NCAAs to set up a championship game match-up with Northern Michigan. In a game that ranks second only in drama to last April's title game, BU rallied from three goals down in the third period to tie the score at 7 apiece with 39 seconds left in regulation. But in the third overtime, NMU scored to deny BU the title. Tony Amonte joined the New York Rangers, just days after the title game begining a long NHL career. His linemates, Shawn McEachern and Keith Tkachuk, and defenseman Scott Lachance all played for the U.S. Olympic team the next season, but all three turned pro and finished the season respectively with Pittsburgh, Winnipeg and the New York Islanders. Defenseman Peter Ahola spent nearly the entire 1991-92 season with the Los Angeles King. Forwards Dave Tomlinson and Ed Ronan were in the AHL much of that season, but each had brief NHL call-ups to Original Six clubs--Tomlinson to Toronto and Ronan to Montreal. All together, seven team members reached the NHL in 1991-92. Four other members of the 1990-91 team also reached the NHL later in their careers for a total of 11: David Sacco (who tied the title game at 7) with Anaheim, Doug Friedman with Edmonton, Phil von Stefenelli with Boston and Ottawa, and Nick Vachon with the Islanders. Vachon, who also played professional roller hockey, went on to star in the hilarious sports spoof, Clark, The Canadian Hockey Goalie. ESPN Video interview with Kieran Millan, who is no stranger to outdoor hockey games. The New Haven Register checked in with junior wing Joe Pereira who recovered from hernia surgery in time to play at Frozen Fenway. For Pereira, a Yankees fan, an added thrill was dressing the visitng locker room stall that Derek Jeter uses. ESPN.com examined how the semester break and time away from the ice may have helped the Terriers regroup for the second half of the season. Freshman Wade Megan's game-winner in the Frozen Fenway game earned him Hockey East's ProAmbitions Rookie of the Week honors. Millan, Pereira and David Warsofsky made the weekly honor roll. BU's commemorative jersey for the Frozen Fenway game, designed by Coach Jack Parker, earned a shout-out from Inside College Hockey's First Shift. Captain Kevin Shattenkirk and assistant captain Nick Bonino appears on the official fan voting ballot for the Hobey Baker Award, won last season by Matt Gilroy. The five largest crowds to ever watch a BU hockey game have all come in the last 26 months and include both Red Hot Hockey games, both contests at last year’s Frozen Four in addition to Frozen Fenway event. NHL.com caught up with Brandon Yip to discuss his early NHL success--5 goals in 10 games since his call-up from the AHL--and the impact of his senior season at BU. "Last season helped out tremendously, I think, in my career and my life," says Yip, who had 43 points and 118 penalty minutes in 45 games last season for the Terriers. "It changed my work ethic around, being around a team with great leadership. Everyone was pulling for the same goal. It was pretty special to be part of that. I definitely learned a lot from it." John Curry has been recalled from Wilkes Barre/Scranton to Pittsburgh by the Penguins. He was called up last season and played in three games. Colin Wilson, now recovered from a painful injury, discusses the obstacles he’s faced in his first pro season. NHL Central Scouting has issued its midyear rankings of draft-eligible prospects. Charlie Coyle was #19 among North American skaters while Yasin Cissé was ranked at #83. 2010 recruit Sahir Gill, who began the season with the Chicago Steel, but has now returned to the BCHL Vernon Vipers, was not ranked. The other two 2010 class recruits, Matt Nieto and Adam Clendening, are eligible for the 2011 draft. The Scouting Report published its assessment of Cissé prior to the foot injury that will sideline the winger from Quebec for the remainder of the USHL season. Coyle has been named to the South squad for the upcoming EJHL All-Star Game. The Globe article was authored by Billy Baker, whose brother Jack Baker— a sparkplug forward for the Terriers from 1998 to 2002—was born Feb. 21, 1980, one day before the Miracle on Ice. 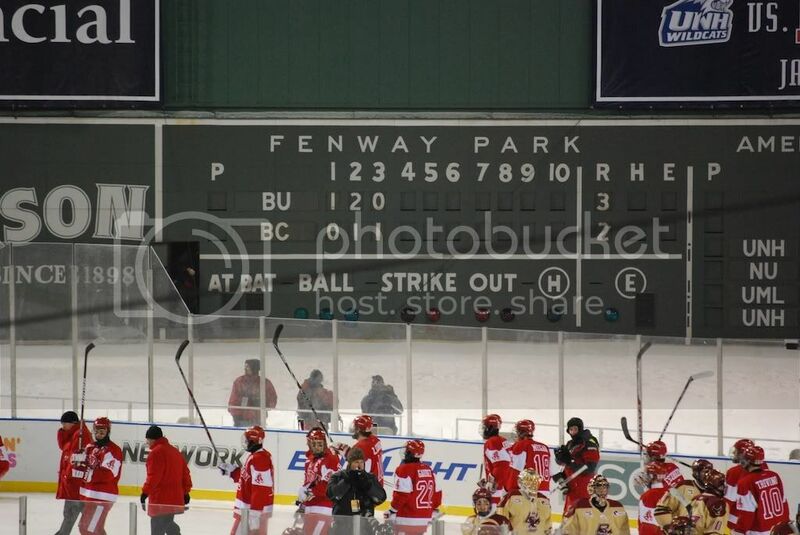 BU Today provides a 360-degree view of Fenway Park during Friday's BU win against BC. Former Terrier defenseman and member of the 2007 Stanley Cup winning Anaheim Ducks Joe DiPenta scored his first goal of the season for AHL Portland in a 6-5 loss to Worcester. San Jose Sharks coach Todd McLellan commented on the decision to promote former BU co-captain John McCarthy from Worcester to the NHL club. He explained that it’s "a reward for him. The organization is very confident in his ability, and he's done a tremendous job in earning this opportunity." Boomer Ewing scored a goal and an assist for the Toledo Walleye in a 6-3 win over the Charlotte Checkers, who received a goal and an assist from Ken Roche. A few weeks ago we posted a link to Scott Weighart’s USCHO feature about the 6-on-3 power play BU employed in the waning minutes of the Terriers’ Red Hot Hockey matchup with Cornell on Nov. 28. BU didn’t score with the three-man advantage, but Nick Bonino did tie the score for BU after the first Big Red penalty expired. Coach Jack Parker had revealed that former Terrier assistant Ben Smith had suggested the tactic of pulling the goalie for an extra attacker when there already was a two-man advantage. During the Jan. 2 game between BU and UMass with the Terriers leading, 6-3, Minuteman Coach Don Cahoon--a member of BU's 1971 and 1972 NCAA championship teams--tried the tactic, but with less success. He pulled goalie Paul Dainton after BU drew two penalties late in the third period. UMass failed to score and after one penalty ended, Eric Gryba cleared the puck 175 feet into the empty net. Now, a New York Times article takes the story one-step further with, of course, another Terrier connection. Smith was coaching Team USA in the 2007 Deutschland Cup in Hannover Germany. The USA squad for the annual event is composed of American skaters playing Germany, but that season, Smith brought on a goalie from the North American minor leagues. Former Terrier MVP and All-American John Curry had begun his first pro season with the ECHL Las Vegas Outlaws when summoned by Smith. Curry's strong showing in Germany led the Penguins to assign him to their AHL affiliate in Wilkes Barre/Scranton where he took over the starting job, winning 24 regular season games and 14 more in the post-season. Blog contributor candycanes99 has prepared an extended, HQ highlight reel of last night's Terrier win the SunLife Frozen Fenway game. 2008-09 co-captain John McCarthy, recalled to San Jose on Thursday, makes his first start tonight against the Red Wings and talked about his first days as a Shark. UPDATE: McCarthy played 11 minutes, took 1 shot and was -1 in the Sharks 4-1 loss. McCarthy is the 64th former Terrier to play in the NHL, joining Matt Gilroy, Colin Wilson and Brandon Yip as players to reach the NHL this season. A list of the 60 previous to this season is here (scroll down). Yip scored his fifth goal (video) in 10 NHL games for the Avalanche in Colorado's 4-3 shootout win over Buffalo. He added an assist and later hit the crossbar during the shootout, en route to earning third star honors. The Denver Post half-seriously asked: "Is it too late for Yip, albeit at the "advanced" age of 24, to get in the running [for the Calder Trophy]? " Former Terrier goalie Rick DiPietro made his first start in goal in more than a year last night in Dallas. Finally recovered from knee surgery, he was on the losing end of a 4-3 game, stopping 22 shots and picking up an assist on the first Isles goal. In San Antonio's 2-1 win against Rockford, Ryan Weston scored his second goal in five games since joining the Rampage on a PTO on Dec. 30. Weston had played 15 games with ECHL Las Vegas this season, registering five goals and seven assists. In San Antonio, he joins his former BU teammate, Sean Sullivan, recently named to the AHL All-Star Game. The 38,472 in attendance marked not only the largest hockey crowd ever to see a college game in the eastern U.S., but the biggest crowd to view any game in the East. 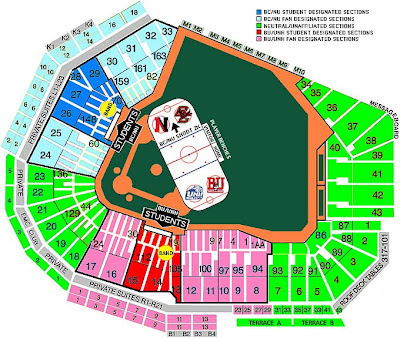 Frozen Fenway outdrew the NHL’S Winter Classic (38,112) by 360. BU scored in the first period on a David Warsofsky (photo) power play slapper. Then in the second period, Joe Pereira, returned from an appendectomy, banked one in off BC goalie John Muse’s pad from an in impossible angle. The lead grew to 3-0 when Wade Megan (photo, CREDITgame’s first star) batted a puck out of the air during a delayed penalty. The Eagles narrowed things with a power play goal late in the period and a shorthander in the third period. • It appeared that no one was enjoying the unique thrill of playing hockey in Fenway Park more than Terrier Head Coach and Red Sox season ticketholder Jack Parker. He could barely contain his exuberance during pre-game interviews on NESN and commented to Coach York and the referees, "How lucky are we to be involved in this?" • The “real” Kieran Millan was immense in goal for BU especially in the third as BC frantically attempted to tie the game, displaying the form that led BU’s championship run last season. He earned the game's third star. • Zach Cohen continues to lift his game and is making life miserable for opposing goalies, setting up shop in front of them. His screens contributed to BU’s first and third goals. • Chris Connolly played an exceptionally strong game in all three zones and disrupted BC breakout attempts all night. 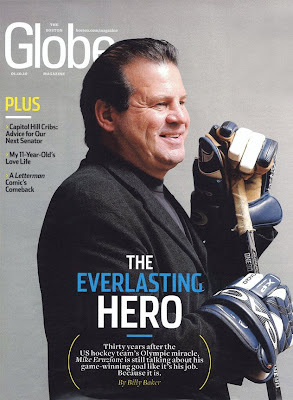 • BU’s honorary captain was Mike Eruzione. His assistants were Tony Amonte and Travis Roy. BC was represented by Brian Leetch, Craig Janney and Marty McInnis. • Both teams wore special commemorative jerseys. BU's (see link below) featured "Boston" in large letters in the Red Sox's class typeface with Red Sox-logo style skates on each shoulder. This jersey will not be made available to the public, according to Coach Jack Parker, who designed the jerseys. • Matt Gilroy and his NY Rangers teammate Brian Boyle, a BC All-American, were interviewed between the periods on NESN. The two are rommates when New York is on the road. • Bernie Corbett’s second intermission interview was Neil Baudette, the Wall Street Journal reporter (and BU alum) who wrote the recent front-page story in the Journal about the Jack Parker-Jerry York rivalry ("Losing is H-E-double hockey sticks for Boston's Icy Odd Couple"). NHL.com BU edges BC, 3-2, in Frozen Fenway; Warsofsky completes a triple crown. We're just a few hours away from the Terriers' first outdoor hockey game since an 8-4 victory over Holy Cross at MIT Rink, 54 years ago yesterday. The SunLife Frozen Fenway game matching BU and BC adds a stunning new chapter to college sports greatest rivalry. But it's not the first time the teams have faced off outdoors. Ninety years ago next month, they played at the Eagles' University Rink, with the host routing the visitors, 9-0. Altogether, BU has played 35 outdoor games, coming away on top 20 times, losing 12 times, with three ties. A few notes before listing all the pre-game coverage and in-game blog information. Both teams will be wearing special commemorative jerseys. BC's can be seen on the Eagles' Web site. BU's will remain under wraps until gametime. We'll try to get a sneak peak if possible. The television broadcast on NESN and NHL Network begin at 7:30 p.m. In addition to the teams' own radio broadcasts, WEEI-AM in Boston will air the game. The women's matchup between Northeastern and New Hampshire begins at 4:00 p.m., also on NESN and NHL Network. During one of the between the periods intermissions, there will be a skills competition, sponsored by ProAmbitions, matching two members of the South Shore Kings '98s: Ty Amonte, son of BU and NHL standout--and recent U.S. Hockey Hall of Fame inductee-- Tony Amonte, and Luke McInnis, son of BC and NHL star, Marty McInnis. The BU Alumni Association is hosting a pre-game rally and watch party at Tequila Rain 145 Ipswich St. Boston, Mass. Beginning at 5:30 p.m. today (details). John McCarthy, co-captain of last season’s national championship team has been recalled from Worcester to the San Jose Sharks. McCarthy has a 6-12-18 line—and a team-leading +14— in 36 AHL games. McCarthy is the fourth member of the Terrier’s 2008-09 squad to reach the NHL this season, joining Matt Gilroy, Colin Wilson and Brandon Yip. Wilson, now rehabbing with the AHL Milwaukee, made a slick pass to set up the Admirals first goal in last night’s 3-2 win against San Antonio. The Rampage later tied the score at twp apiece on a slapper from the high slot by former BU captain Sean Sullivan. It was the sixth goal of the season for Sullivan, who was briefly recalled by Phoenix this season and has been named to the Planet USA squad for the AHL All-Star game (TV outlets). In the ninety-plus year history of the BU-BC hockey rivalry, the teams have faced off in a variety of campus sites and for tournament games at Boston Garden—old and new—the Worcester Centrum and the Providence Civic Center. Tomorrow night, The Battle of Comm Ave. (click on films for trailer) has a new address—4 Yawkey Way. 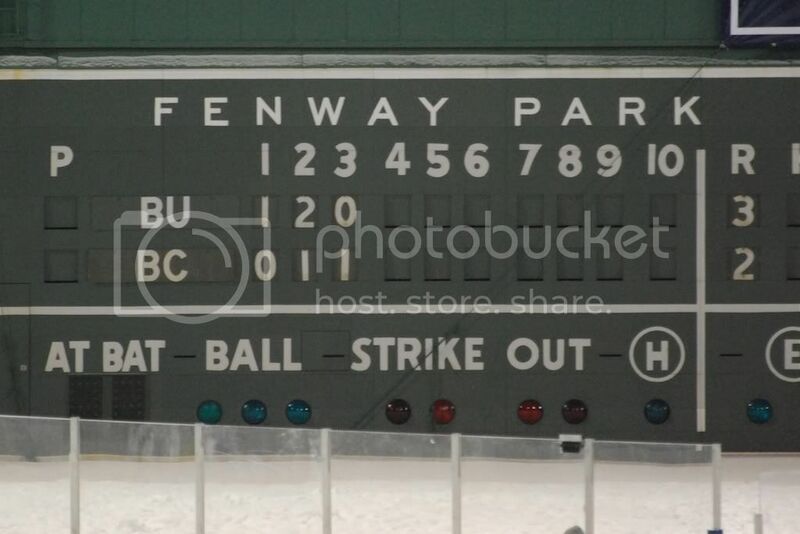 As the long-awaited game at Frozen Fenway approaches, we have a boatload of articles and videos to share. ESPN’s pre-game coverage begins with a feature that has BU Coach Jack Parker and BC’s Jerry York, rivals for some 42 seasons, recalling their early days playing pond hockey in towns surrounding Boston (we’ll have to excuse one glaring factual error). ESPN also looks at the Terriers’ disappointing first semester results, talks with top freshman scorer Alex Chiasson and offers video from yesterday’s practice session and press conference at Fenway Park. 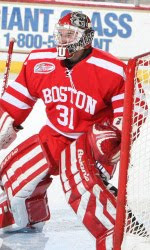 The Boston Hockey Blog covers the Terriers’ week of preparation and reveals that sophomore Kieran Millan will get the start in goal for BU. Tim Rosenthal of Inside Hockey previews the 248th game in the rivalry which BU leads, 123-107-17. More press conference coverage. So does MLB.com whose story features a classic photo of Parker and York at Fenway Park following Wednesday’s practices. NHL.com’s Bob Snow offers two feature pieces. The first offers takes on the upcoming game from Terriers and Eagles past and present, local fans and even a few participants in last week’s NHL Winter Classic. The second looks at the intensity of the BU-BC rivalry and includes a side “ranking the 3 biggest BU-BC games.” Snow’s picks are: 3) The 1986 Beanpot Final (BU 4-1); 2) The 2006 NCAA Regional Final (BC 5-0) and the 1978 NCAA Championship game (BU 5-3). USCHO’s Brian Sullivan reports on the BU-BC alumni game, a private charity event held this past Monday at Frozen Fenway. Fifty-four participants raised nearly $16,000 for The Travis Roy Foundation and the Educational and Health Fund for Christopher J. Cleary. NESN which will broadcast the game (NHL Network will carry the NESN feed as well), ranked the top 10 BU and BC alumni to “make it big in the NHL.” Tom Caron talked with Parker and York and some of the players following Wednesday’s practice BU captain Kevin Shattenkirk and BC captain Matt Price were guests tonight on NESN’s Bruins Faceoff Live. NESN hopes to have former BU captain Matt Gilroy in studio to talk about the game tomorrow evening. En route to winning a gold medal with team USA in the World Junior Championships in Saskatoon last night, sophomore defenseman David Warsofsky found himself on the wrong side of a two-goal comeback. Warsofsky, of course, had been part of BU’s two-goal rally in the final minute of the NCAA title game last April, before the Terriers won in overtime. Last night, Team USA had a two-goal edge over five-time defending champion Canada with just three minutes left in regulation. But a power play for the hosts was followed by a tying goal and Warsofsky found himself in familiar territory, heading to overtime in a championship game. Four and a half minutes into the extra session, Team USA’s John Carlson (video), on an odd-man rush, blasted the puck home for a 6-5. win. Reuters photo by Shaun Best: L-R, Ryan Bourque, Carlson, Warsofsky. Team USA’s gold medal came six years to the day after the Americans only other WJC title. Warsofsky became the first Terrier to win gold at the WJCS and the first to earn a WJC medal since 1997 when Dan Lacouture and Tom Poti were part of the the silver-medal squad. Warsofsky's gold medal followed one day after 2011 recruit Alexx Privitera earned gold with Team USA in the World U17 Challenge in Ontario. Warsofsky, who talked with his hometown newspaper in Marshfield, Mass. 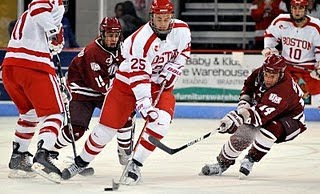 about his tournament experience, is expected by in uniform on Friday evening when BU and BC face off at Frozen Fenway. That much-waited game will be the main topic during today’s edition of Hockey On Campus, which airs online today from 4-7 p.m. ET. Bernie Corbett and Paul McNamara will also preview the Northeastern-New Hampshire women’s game that precedes the Terriers vs Eagles tilt on Friday, as well as recapping the WJCs. Colby Cohen’s 2-goal, 2-assist effort against UMass on Saturday earned him a share of Hockey East’s player of the week honors, which he shared with Vermont’s Justin Milo. Zach Cohen and Kevin Shattenkirk, with three points each, were named to the league’s top performers list. The Colorado Avs, under first-year coach and former Terrier forward Joe Sacco, are among the surprise stories of the first half of the NHL season. At the midpoint, the Avs are second in the Northwest Division, just a point behind Calgary. Sacco discussed his "rookie" season behind the bench with ESPN. Former BU goalie Rick DiPietro is expected to return to the Islanders’ net this weekend for the first time this season, following recovery from surgery and some AHL rehab. DiPietro will back up Dwayne Roloson tonight with the Isles visiting Sacco, Brandon Yip and the Avs. Friday’s match-up with longtime rival BC at Fenway Park is just a few days away. In Hockey East Online’s “5 Minute Major” interview series, Commissioner Joe Bertagna talked about the contest which will be the nightcap of the “SunLife Frozen Fenway” doubleheader. There will be at least two Gilroy brothers at the game, as former BU co-captain Matt Gilroy told the New York Post, he’ll be watching brother Kevin and the Terriers in person. He’ll be in town for the Rangers’ game against the Bruins on Saturday. While Brandon Yip has realized a longtime dream of playing in the NHL, he told the Denver Post he would have loved to be playing in Friday’s game at Frozen Fenway. Blog contributor candycanes99 has prepared an extended highlights reel of Saturday’s 7-3 win against UMass. Colin Wilson had a goal and two assists for Milwaukee in the Admirals 6-4 loss to Hamilton on Sunday. Wilson is looking to return to Nashville where he began the season, prior to an injury. Syracuse Crunch wing Chris Higgins, also injured for much of the season, is now healthy and has been sent to the Gwinnett (GA) Gladiators in the ECHL where he’ll rejoin former linemate Jason Lawrence. Looking ahead 2010 recruit Charlie Coyle registered his 13th goal of the season in the South Shore Kings’ 4-1 win against the Vermont Glades. Coyle, whose cousin is former BU and NHL standout Tony Amonte, is projected to be a high draft pick in June’s NHL entry draft. 2011 recruit Alexx Priviterra and the NTDP U17s come home from the World U17 Challenge with gold medals after a 2-1 win against Ontario in the championship game.